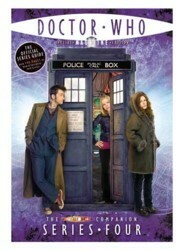 At 148 pages, The Doctor Who Companion - Series Four is the biggest DWM special so far, and gives readers a step-by-step guide to the making of all 13 episodes as well as the 2007 Christmas special Voyage of the Damned and the Children In Need scene featuring the Fifth Doctor, Time Crash. Tom Spilsbury, the editor of Doctor Who Magazine, said: "DWM has been given exclusive access to all the scripts and shooting schedules to tell you what was shot when and where, what was left on the cutting-room floor and why, and even the truth behind a few of those rumours that hit the tabloids! "Packed with anecdotes and comments from the men and women who make the programme, script extracts, deleted scenes, and a full list of cast, crew, transmission times and ratings, with hundreds of beautiful and previously unseen photographs, this is the ultimate guide to Doctor Who 2008."